← Chapter 8a: Contrasting angles effects in recognition and naming tasks of the Role Of Depth Cues.. The results of (Yes‑No) response in experiments 1 and 2 demonstrate a consistent difference between “Yes” and “No” responses. The subject in the present study was asked during the recognition task to make either a “yes” or a “no” response about each object picture. As the results stand, performance was facilitated when the subject made a “yes” response. The time to respond “yes” is less than the time to respond “no”. 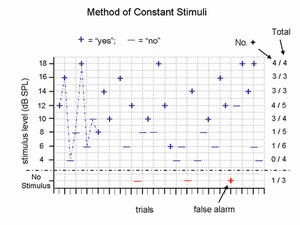 The speed of “no” responses, however, was also a function of the relative discrminability of the different stimuli; reaction times were long when different stimuli contained a few attributes that differed from each other and less time was required, when they contained many attributes that differed from another object. This is supported by the 2‑way interaction between ‘yes’ and ‘no’ response and binocular and monocular viewing condition. It appears that the binocular as depth cue elicited a higher level of performance than did the monocular view. Three‑dimensional representations of the object are named and recognized somewhat more readily than are two‑dimensional representations. While both three‑dimensional and two‑dimensional representations carry enough informational content to enable the subject to recognize the visual object, the binocular view added more information which facilitated name retrieval, possibly by arousing a larger number of associations. The subject must process a number of dimensions in order to decide whether the target object is “same” or “different”. If the subject processes these dimensions one at a time, one after another, this may be called serial processing or s/he may process all the dimension simultaneously which is called a parallel processing models. When the stimulus presented is the same as the target object, that is the identity of the comparison stimulus selected from memory [memory item], the subject must process all the relevant dimensions in order to be sure that the stimulus is the “same”. The selection of the appropriate response is probably influenced by the subject remembering an object s/he already knows which resembles the picture object, with the subject then judging the knowledge of the “object picture” according to his judgement of the “object retrieved from memory”, as the same object is viewed sequentially in a different orientation. Thus, there are probably further strategies by which the appropriate responses might be made from memory for comparison to the test stimulus. It seems that the response selection requires more features of the object to be examined as the object is rotated further in depth from the prototypical view, that objects are examined more times per second, and that there is more use of the stimulus to search through memory and compare to retrieved “exact prototypes”. The constructionist view of memory (Neiser, 1967) would suppose that part of what is stored about a stimulus is the series of cognitive operations or constructive activities needed to arrive at a decision about the stimulus. An implication for the present experimental conditions would be that if the subject “recognized” a visually presented object, then s/he should be able to remember what kind of response (yes or no) s/he had made about it during the search through memory. It is unlikely that the increase in reaction time across rotation reflects increases in the response selection stage. Logically, there is no reason why angle of rotation should effect response selection, since it is assumed that the shape judgement is completed before response selection begins (Beck & Gibson, 1955; Hochberg 1935). However, taken together, the results of the two way interaction between “yes”‑”no” and angle 90 degrees in both Experiments 6 and 9, the results suggest that presenting objects for matching in the same orientation (i.e., presenting an object in 90 degrees) increases their perceptual similarity relative to when they are presented in different orientations (i.e., angle 0 and 45 degrees). One reason for this might be that subjects generate axis‑based object descriptions and maintain information about the orientation of the axis. RTs to match objects may then be facilitated by presentation of the object in the same orientation because orientation information does not have to be recomputed. However, matching orientation information may also activate internal recognition or response processes that are incompatible with those activated by the mismatching object descriptions (Erikesn et al., 1982; Proctor, 1981). Inhibition at the decision stage may cancel out any facilitation of earlier processes. The fact that a variable interacts with “same” and “different responses, however, does not unequivocally indicate that the two types of matches are based on different processes. A more common interpretation of interactions in several studies has been that two variables that interact affect the same stage in a sequential series of processing stages (Pachella, 1974; Sternberg, 1969). Thus, if the processes underlying the “same‑different” disparity are located within the same stage of processing as those the effect is a direct function of similarity to the first pattern. Similarly, with “different” stimuli, the tendency to mis-identify a visually similar pattern as the previous stimulus (and the resulting interference) would also be a direct function of similarity. In many situations the difference between “same” and “no” disappears within an interstimulus interval of approximately 2 sec. (Posner & Keele, 1967). As activation declines across the interstimulus interval, so would the effect of visual similarity. In addition to the studies that have examined effects of visual similarity by varying attributes, studies have been conducted in which irrelevant attributes such as size ( Larsen & Bundesen, 1978) and colour (Kroll, Kellicutt, Berrian, & Kreiseler, 1974) differ between stimuli that are to be classified as same. These studies have also shown that at short interstimulus intervals “same” responses to stimuli that differ in irrelevant dimensions are slower than to stimuli that are identical on all dimensions. Support for this conclusion is evident is Larsen & Bundesen’s (1978) study in which they also employed a single‑character classification task. A repetition effect occurred in which repeated stimuli were classified more rapidly than non‑repetitions. Most importantly, the reaction time function for size differences in the classification task was similar to that for successive matching. Thus, the locus of reaction time differences was based on the time to encode the second stimulus. The results of Experiments 3 and 6 show no differences between “yes‑no” response type. This suggests that recognition relies on featural or analytical analysis. According to the distinctive features account, “features” are mapped onto stored descriptions, recognition occurring when sufficient features have been processed to specify the object and differentiate it from other similar object. If features become detectable at different views, and the number of features needed differs between and within objects, then a variety of response would occur. The failure to recognize the object from the first features to appear necessitates rotation through an arbitrary angle until, for any particular object another feature emerges, and so on. However, the type of the results of Experiment 7 regarding the RT differences between “yes” and “no” responses reveals that “no” RT was faster than “yes” RT when three (angle, stereopsis and colour) attributes of the visual stimuli were included. The results obtained from the experiments in the present study confirmed the trend observed in other experiments mentioned in the literature review. Some experiments have found “same” responses to be faster than “different” responses ( e.g., Bindra, Donderi, & Nishisato, 1968; Keuss, 1977; Snodgrass, 1972) whereas others have found the opposite relationship (e.g., Bindra et al., & Zelnicker, 1969). A few experiments have even found “same” and “different” reaction times to be approximately equal (Ambler & Proctor, 1976; Black & Beilin, 1975). There are two kinds of explanation that have been put forward for this disparity between both types of “yes‑no” responses. The advantage of “yes” response over “no” response suggests a holistic comparison for “yes” responses, while “no” responses faster reflects a more thorough self‑ terminating, feature‑by‑feature analysis. Both processes are necessary because the two forms of comparison are not compatible; a feature checking model predicts the longest RTs for “yes” judgements since all features of an array would have to be compared. Identical would thus inhibit each other while different features would pass through the feature‑processing system faster than the others to arrive at later processing centers. Since “yes” RTs were found to be faster than “no” RTs in two experiments (1, and 2) in the present study a process in addition to feature checking must be proposed. Analytical comparison provides a powerful advantage for different judgements (no‑response), since the subject may self‑terminate and respond “different” as soon as a mismatching element or feature has been detected but must examine all segments before responding “same”. The distinction between analytic versus holistic processing is the most popular dichotomy in cognitive psychology. Analytic processing is said to occur when the stimulus array is processed in terms of its constituent parts. Therefore, individual features play an essential role in the identification and comparison of stimuli (Bamber, 1969; Taylor, 1986), where holistic processing occurs when a stimulus array is processed either on the basis of same template kind of match in which individual features play no part (Bamber, 1969) or on the basis of “emergent properties” (Pomermtz, Sager & Stoever, (1977), that are not components per se but arise from the interrelations among the components. This dichotomy has been used to explain findings from experiments where pairs of simultaneously presented stimuli are recognized as being the ” same ” more quickly than they are “different” by a subject. If analytic processing alone was used in this same / different paradigm, then every feature would have to be checked in turn by the subject to see if there were a mismatch detected. As soon as a mismatch was detected then a “different” response could be given. If the two stimuli are the “same”, then every pair of features has to be checked before a “same” response can be given. For sequentially presented stimuli, a large number of studies have found “different” responses to be faster than “same” responses (Bindra et al., 1968; Coltheart & Curthoys, 1968; Navon, 1978; Nickerson, 1971). In a series of individual difference studies involving variations on the same‑different reaction time task, for example, Nickerson, (1973, 1978), it has been found that the time taken to judge letters as physically the same is often less than the time taken to detect that they are different. This finding has led to two classes of models attributing the same‑ different disparity either to the comparison or the encoding processes. Hock (1973); Hock, Gorden, and Gold (1975); Hock, Gorden, & Marcus (1974); Hock & Ross (1975) have differentiated between the structural mode of processing emphasized by some subjects and the analytic mode of processing emphasized by other subjects. Hock’s distinction between structural and analytical processes is conceptually comparable with Neisser’s (1967) distinction between synthetic and analytic processes. Hock’s structural processes and Neisser’s synthetic processes are similar in their emphasis on “putting together” or organizing the stimulus information into a complete precept (the terms “structural” and “synthetic” are hereafter used inter‑changeably), and both Hock & Neisser view analytic processes as decomposing the stimulus information into a set of features. It should be noted in this regard that Gestalt‑type configuration properties (e.g. symmetry) can serve either a structurally similar or different, such properties can serve as rules for organizing the detailed parts of the stimulus into a whole. Analytically, they can function as global features for inferring the categorical identity of the stimulus. The initial evidence for the distinction between structural and analytic processes was obtained by Hock (1973), and subsequently replicated by Hock & Ross (1975). In both these studies, a significant correlation was obtained between the effects of symmetry (symmetrical vs. asymmetrical patterns) on ”same” reaction times. Moreover, analytic subjects attend to the featural parts of a stimulus, while structural subjects organize the parts of the stimulus into wholes, as was shown by Hock, Gordon, & Marcus (1974), who found that analytic subjects detected embedded figures more rapidly than structural subjects. In a subsequent study comparing reaction time of physical matches (e.g., AA) and name matches (e.g., aA). Hock, Gorden, & Gold (1975) obtained evidence that analytic subjects base their ”same” responses to physically identical stimuli on a comparison of verbal codes, while structural subjects base their physical matches on a perceptual comparison. The tendency of analytic subjects to code visual information verbally was consistent with Bruner’s (1957) intonation that our perceptual knowledge is organized to achieve efficiency in stimulus identification. What about the occasions when only a two stimuli are different ?. It might be that the subject has to discover enough information to decide that the stimuli are “different”, or s/he may wait until processing has finished on all dimensions before making a decision. In the case of two stimuli being different, it is most probable that the mismatching feature will not be the last feature checked, so a “different” response can be given quicker than a “same’ response. There is evidence from performance‑limiting identification tasks that the processing of successive stimuli is easier than the processing of simultaneous stimuli (Tulving & Lindsay, 1967) and that recognition a stimulus, which clearly depends on some sort of memory‑matching process, is easier than matching two simultaneously presented figures (Erikesn, Munsinger, & Greenspon, 1966). An examination of the literature indicates that sequential presentation increases the fast‑same effect only when the display is much larger than this. A significant enhanced fast‑same effect with sequential presentation was found by Corballis, Lieberman, & Bindra (1968), and in experiment 1, 3 and 4; no effect was found in experiment 2. It is possible that differences between memory‑ and adjacent‑match RTs occur because subjects attend to only one item at a time from a visual array, and in the simultaneous case processing of the second item is delayed. Although, the response type of “yes” and “no” as a main effect in Experiments 6 and 9 but “yes” was generally faster than “no” responses. This advantage of “yes” response is indicate the fast “yes” RTs were based on a judgement of one object compared with long‑term memory, and it is well known that when an subject is not required to discriminate between two simultaneous signals, RTs may be facilitated rather than inhibited (Bliss, 1893; Poffenberger, 1912; Todd, 1912), and therefore it seems likely that the stored item was more accessible. Despite the wide variety of research conducted with the matching task, there has been little agreement regarding the exact nature of the underlying processes that influence match reaction time. However, Steiger & Yuille (1983) have demonstrated that the effect of mental rotation on recognizing three‑dimensional shapes is much slower when two shapes are presented simultaneously than when one shape is compared with a long‑term memory representation. Although it is quite hard to assess the exact source of the difference in rate of mental rotation between the two modes of simultaneous and sequential presentation of visual stimuli, one possibility that only one shape is present in the visual field when a shape is compared with long‑term memory representation. Perhaps operating on only one shape does not require as much processing capacity as operating on two shapes. If the rate of mental rotation depends on how much processing capacity is available, then we should expect faster rotation rates when only one shape is processed than when two shapes are processed. Another possibility is that the reduced slope in the sequential presentation ( memory‑item) results from superior encoding of the shape, which reduces the time needed to compare the two representations. This is because the shapes encoded in long‑term memory may have been parsed into an optimal number of subparts, thereby reducing the number of comparisons that must be made. Taken together the results of the present series of experiments reveal that the differences between “yes‑no” response from one experiment to another have proved to be useful in explaining the underlying processes in matching visually presented stimuli. The act of comparing two things and determining whether they are the same or different is basic in mental activity. Effects of orientation on the identification of visual shapes proved to be diagnostic of the underlying processes during pattern recognition. The results of the present study were obtained using within and between‑subjects designs and using the same orientation between the objects in one experiment from 1‑9. Thus, the differences in results could be due to individual differences or to differences in method of presentation. It must not be forgotten that the subject is the largest possible source of experimental error. Kempler & Weiner (1963) conducted a study into personality and perception in the recognition threshold paradigm. They proposed that difference in response characteristics both within and between subjects were specified independently of the experimental recognition response and attributed such differences to personality factors; attitude and to achieve, for example. Also a series of publications (e.g., Bruner & Postman, 1974) suggest that the perception of external stimuli is not free from the shackles of internal events such as values, expectancies, needs, and psycho-dynamic defenses that all impinging on perception. This view became loosely known as the “New Look” which suggests that perception of stimuli may be inhibited (perceptual defense); said to occur whenever the recognition threshold for a stimulus is raised) or enhanced (perceptual vigilance; with corresponding lowering of the threshold) as a function of the input’s emotionality. Eerily (1974) suggests that perceptual selectivity is pervasive throughout the cognitive continuum, from input to output, and no single site is likely to provide an exhaustive explanation of any substantial selective phenomenon. On a physiological level, Harris (1965) proclaimed that the diameter of the pupils of the eye expand and contract partly as a function of the perceiver’s attitudes and needs to achieve, for example. This may actually alter the sensitivity to the stimulus (Hutt & Anderson, 1967). Fry (1963) suggested that this can occur in voluntary blurring of the retinal image by differential accommodation of the lens. Thus, these two peripheral receptor systems in the visual receptor organs, namely pupil diameter and accommodation of the lens, both appear potentially responsive to the emotionally and general meaning of the input. Bowland (1958) made the point that fatigued subjects cannot be expected to provide adequate data. Although the subject in the present experiments were given appropriate breaks, they repeatedly reported that the trials themselves were rather too lengthy and in many cases caused restlessness. The significant effect of angle of views in the present study of the recognition tasks raise another assumption about subject’s strategy to perform the task. The recognition process is critically dependent on the properties of perceptual visual storage since it is the information held in the mind that must be transformed. The properties of perceptual storage, therefore, become important issues in visual information processing. In this tachistoscopic study the interest is read‑out of information in visual store‑ the processing of the information that uniquely characterizes a particular object. Nevertheless, other stages of processing are involved even in tachistoscopic experiments, for example, the decision or response selection(i.e. ; yes/no response) process will affect the actual response given by the subject. Some other factors such as the size and visible parts of the rotated object in depth may be important for depth rotations. Several studies have shown that normalizing stimuli for size takes time, even when the size is an irrelevant dimension (Besener & Clotheart, 1976; Bundensen & Larsen, 1975; Bundesen et al., 1981; Dixon & Just, 1978; Sckuler & Nash, 1972). For example, Bundesen et al. showed that size normalization and mental rotation were independent processes. They argue that disparities of size were visually resolved as differences in depth (even for their 2‑D alphanumeric stimuli), and that mental transformation times were directly proportional to these depth differences. It is critically important to note that in the present study depth of the objects were created by rotating the object itself around “x – y” axis, so that the relative sizes of the three objects were the same, but some parts were shortened at larger depth (i.e., 0 degree). Further research with different kinds of depth rotations should help establish whether the effect of angular differences between 0 degree and for both 45 and 90 degrees is due to a size normalization process as a function of the particular type of depth rotation used, or to the depth rotation per se. Another aspect of the present results indicate the important role of presentation mode. The visual display in both tasks in the present experiments 1-10 were based upon a memory task as the subjects were presented sequentially, one at a time and s/he had to compare each presented stimulus with the representation in the long term‑memory. Thus, the effect of the mode of presentation upon both object recognition and object naming of rotated objects in depth might be an important factor in the present study. Steiger & Yuille (1983) have demonstrated that the apparent rate of mental rotation for three‑dimensional shapes is much slower when two shapes are presented simultaneously than when one shape is compared with long‑term memory representation. Apparently mental rotation is not a specifically visual process, but rather can be abstract and amodal in nature (Carpenter & Eisenberg, 1978). Overall, of the present study indicates that the distinctions between a representation of an image, and representations of object, and between viewer‑centered and object‑centred co‑ordinate systems, are both fundamental and important in object recognition and object naming. Generally speaking, results such as these suggest that successively more abstract descriptions can be generated during visual object processing, progressing from a retinally coded description, to a non‑retinotopic viewpoint‑specific description, to a yet more abstract description which can serve the recognition of an object across differing viewing distance and angles. Taken together, the overall RTs differences in viewing condition between the recognition and naming tasks and also, the information required to perform each task which formed by the same variables in the present study reveals the importance of the task demands, the individual difference and finally the visual characteristics of objects. The findings from the present series of experiments have demonstrated the merits of depth perception on the orientation of common objects. In doing so, they have shown that the effectiveness of visual information process is dependent on the task demands and the type of underlying visual perception. The view of the nature of the human visual system that seems to be emerging from the work presented in this thesis resembles that of the “connectionist” models of behaviour. Connectionist models have become increasingly popular devices for conceptuality information processing in a number of fields. connectionist models are built from large numbers of processing units that each perform computationally simple functions, such as exiting inhibiting other units they are connected to. It is interesting to note that the visual system seems to be organized, at least initially, such that the analysis of the different properties of objects proceeds largely independently of each other, then the term of “modularity”. Independent modules can be designed, altered or damaged without too much impediment to the system as whole. The connectionist approaches to modelling visual processing could promote exiting theoretical developments for the future research in which we may develop a clear idea of how the visual machinery of the brain achieves consistent interpretations of surface layout. The second point I wish to clarify the internal representations of objects we see from outside (i.e., from the world). First, it seems that this representations has been internalized through biological evolution and so, for each individual, is pre-wired rather than acquired. Biological evolution would seem to have embarked on an un-characteristically profligate course if they very most enduring and pervasive facts about our world, such as that it is three-dimensional, locally Euclidean, isotropic (except for the unique upright direction conferred by the earth’s gravitational field), and populated with objects that therefore have just six degrees of freedom of rigid motion-had not been in any way incorporated into our genetically transmittable perceptual wisdom. Without such incorporation, this wisdom, so crucial for survival in such a world, would have to be learned, laboriously and at appreciable risk, by each every new-born individual de nova. I prefer to continue my research for the ways in which the mind has internalised structure that pre-exited in the world. The study of transformations of rotated objects in depth seems to me have provided a reasonable starting point. Generally, the experimental design of experiment 1‑3 and 6‑9 consisted of two different tasks. In the naming task, the subjects were instructed to name each stimulus in a succession one at a time. A survey of the experiments that have employed items such as single‑frequency tones (e.g., Nickerson, 1971), multi‑dimensional visual stimuli (e.g., Egeth, 1966), and Japanese visual characters (Ambler & Proctor, 1976; Proctor, 1981) reveals a chaotic structure on the surface. Every possible relationships between “same and different” reaction times has been obtained. Although “same” RTs are often found to be slower than “different” RTs for uni‑dimensional stimuli which are not highly discriminable (Kellogg, 1931; Bindra, Williams & Wise, 1965), for multidimensional and easily discriminable stimuli “same” RTs are usually found to be faster than “different” RTs (Nickerson, 1967; Bamber, 1969). At the same time, “different” RTs decrease with increases in the difference between two uni‑dimensional stimuli. Because of these ambiguous results, several investigators have proposed that different processes underlie judgements of identity and judgements of difference (Bamber, 1969; Tversky, 1969; Kruger,1970). Most of these models propose that a fast identity reporter, perhaps based on template or image matching, underlies “same” responses whereas a slower feature‑by‑feature comparator is responsible for “different” responses. Several experiments in which subjects were instructed to make comparisons between two stimuli have been described by Posner and Mitchell (1967). “Same” reaction times (RTs) have generally been found to be faster than “different” RTs for both memory and discrimination tasks,( Posner, Boies, Eichelman & Taylor, 1969), although Nickerson (1967) found insignificant overall differences between “same” and “different” responses. Nickerson (1969) investigated in two experiments the relation between “same” and “different” RTs with a set of patterns for which the discriminations are clear. The subject’s task was to decide as quickly as possible whether two simple visual stimuli were the same or different. Stimuli varied with respect to three attributes : size, colour, and shape. Pairs of stimuli were presented either simultaneously or in sequence. Nickerson found that ” same” RTs were faster than “different” RTs to stimuli differing in only one dimension for both memory and discrimination tasks. Matches in the discrimination task are based on visual features of the features of the stimuli rather than their names. For example, Hochberg (1968) has shown that familiarity had no effect on either RTs or thresholds for “same” ‑ “different” judgements for foveally presented strings of letters. Posner and his co‑workers (Posner and Mitchell, 1967; Posner et. al., 1969) found that “same” RTs for physical identical stimuli tasks were faster than for name‑identical stimuli for discrimination tasks and for memory tasks in which the inter‑stimulus interval was less than 1 sec., although Posner’s results suggest that, after that interval, a stimulus stored in memory is coded verbally. Tversky (1969) has shown that the form of the encoding may take a visual or verbal form, depending upon task requirements. Posner and Mitchell (1967) provided good evidence that subjects can employ two distinct stimulus‑comparison processes either simultaneously or in very rapid succession. The encoding account applies only to successive matches. Proctor (1981) argues that the same‑different disparity occurs only for successive matches. It is clear that in some instances the disparity appears in simultaneous matches and so must be accounted for ( Bangra, Boles, Simon & Umilta, 1982; Bindra, Donderi & Nishisato, 1968; Royer, 1981). According to Proctor (1981), letter comparison regardless of case (e.g., AA or Aa) always involves the name code, at least when successive matches are considered, and it is assumed that the first item can act as the prime, and if the prime is valid, and then the process of encoding the second item is facilitated by the already activated pattern. When the two items are different, the prime is invalid and the second letter’s encoding gains no beneficial effect. On the contrary, a conflict between activated patterns ensues, bringing about inhibition and, thus, slow reaction times. However, Bangara et al, (1982) reported evidence that a visual code can be used in successive matching. On the other hand, the two processes account has been criticized for lack of parsimony (Proctor.1981) and inadequate consideration of errors (Kruegar, 1978). Kruegar (1978) proposed a single‑process comparison model to explain the same‑different disparity. This model postulates that the perceiver bases both positive and negative judgements on how many mismatching features a “different counter” records. However, since interval noise may produce a positive difference count even for more same pairs, all positive counts must be rechecked to assure that the counted mismatches are not due to noise. As a result, all “different” responses are not reliably shorter than “same” responses (Bindra et al., 1968; Proctor 1981). Gallery | This entry was posted in Cognitive Neuropsychology and tagged Depth perception, Dimension, Disorder of visual Imagery, Experiment, Experiments 3, Hochberg, Mental chronometry, Object recognition (computer vision), Object recognition Disorder, Social Sciences, Steropsis, Stimulus (physiology). Bookmark the permalink.